This past weekend, Cool Springs Primitive Baptist Church near Danville, GA celebrated her annual August Meeting. There was precious little about the weekend that we would have desired to change, for the only glaring change that would have been made was for the meeting to have kept going on. The church invited Elder Will Martin – pastor of the Macedonia PBC near Cartersville, GA. – and Elder James Conley – pastor of the Union PBC near Ruth, MS. – to preach the meeting. Both of the brethren yoked up well with the other to tread out the corn all weekend long. Since neither of them could stay through the Sundaynight service, the church invited Elder Jon Mizell to preach that service, and his effort followed in the same vein, caliber, and quality of all that had preceded it. Many of our body commented on how much the meeting meant to them personally. From beginning to end, much rejoicing was felt and shared by all. One of the great benefits of a meeting like this is that it serves as an extra spiritual battery booster. Please pray for us that we may go in the strength of this meat for many days. 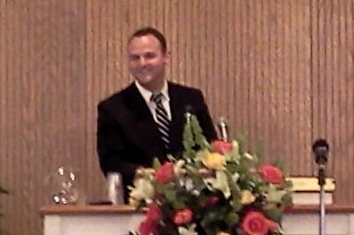 For those that would like to listen to the sermons, they will be posted soon to our website at:coolspringspbc.org. I have attached an outline below showing the order of services. Brethren, rejoice with us! 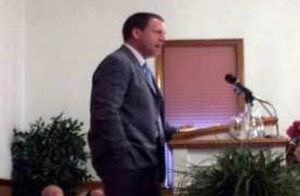 Preaching: Elder James Conley – Jude 3, Earnestly Contending for the Faith Once Delivered to the Saints. Brother James showed the beauty of what we have to stand for, and how that such a solid foundation in God’s mercies should embolden our walk to diligently serve Him. 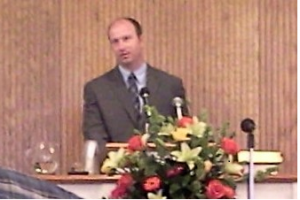 Preaching: Elder Will Martin – Matthew 1:18-25, Considering the Promises of God in Christ. Brother Will related the story of Joseph receiving the message of the nature of his espoused wife’s child. He then related that to how we receive the news of Jesus Christ and hold on to the promises that God reveals to us. Preaching: Elder Will Martin – 4 Small but Wise Things. Brother Will talked about the 4 things in Proverbs 31 – ant, coney, locust, and spider – that are small but wise. These natural creatures were then correlated into a spiritual plane to show they serve as aspects of our fellowship and closeness to God. Preaching: Elder James Conley – Triumphing In Christ. Brother James began in II Corinthians 2:14 showing that though we do triumph in Christ finally and fully in the eternal scope we can triumph in Christ in all seasons and times. He then proceeded to show the method of how that is accomplished in our walk here in this world. Preaching: Elder James Conley – Work and Functions of the Holy Ghost. Brother James showed in great detail and beauty the different works of the Holy Ghost. From regeneration, comfort, help, and many others, the Holy Ghost is truly a present help for every distress and situation. Preaching: Elder Will Martin – I Timothy 4:13-16, Nourishing the Gifts We Have. Brother Will showed forth several points about gifts that God has given us. Whether ministers or not, we all have gifts that God gives that are to be nourished in a similar manner. The end result is great deliverance from the torments of Satan and the world. Preaching: Elder James Conley – Husbands and Wives Pleasing Each Other. Brother James started by showing the natural analogy and illustration of marriage and a good relationship. He then proceeded to show forth the ultimate example of a husband in The Husband Jesus Christ who does please His wife. He then showed how that the bride of Christ should seek to please her Husband in all things. Preaching: Elder Jon Mizell – The Rich Young Ruler. Brother Jon showed that it is possible for a regenerate child of God to hear the right message, at the right time, from the right one, and still leave very sorrowful. The encouragement to the child of God today is to faithfully obey the message from Christ to experience the full life of spiritual family and friends with close communion with Jesus Christ.